Successfully Added 2GB Plug-In Car MP3 Player (with FM Transmitter) to your Shopping Cart. 2GB Plug-In Car MP3 Player (with FM Transmitter). An easy to use Plug-in Car Multimedia Player with 2GB of built-in flash memory. For use with all vehicles, this is an ultra portable MP3 player that will conveniently play your favorite digital music files. Why bother going to the expense of buying a larger, more expensive player that also requires additional wiring, cabling and maintenance? With this handy device, simply set the FM radio frequency and the the device will play through the vehicle's speaker system using FM radio transmission to provide rich stereo sound for your music. With a spacious 2GB of internal flash memory, support is provided for popular music formats. Simply transfer your files from your PC directly on to the device via high-speed USB, it's that simple. With 6 EQ modes to suit your mood and your music, relax in style with this 2GB Plug-In Car MP3 Player (with FM Transmitter). With a simple to use menu interface, you can easily and quickly navigate to your favorite music tracks with the minimum of hassle. This 2GB Plug-In Car MP3 Player (with FM Transmitter) would be ideal for drivers who enjoy relaxing to their favorite multimedia on their journeys but also want to avoid the hassle and cost of installing a large DVD multimedia unit. It would make an ideal gift for commuters and music lovers who drive frequently. 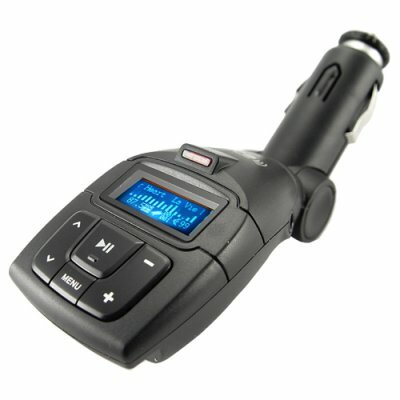 Built-in FM wireless transmitter. Listen on your cars own FM stereo system. How many MP3 tracks can this device store? If an average MP3 track is 5MB, then this 2GB Plug-In Car MP3 Player can store literally hundreds of your favorite music tracks. on 2009-11-21 04:29:21 it is a very good player it is beter than i expect!!! it is very good and the packaging is also very nice. It even comes with a spare fuse. I purchased this unit as well as the $10 cheaper one that reads SD cards and USB sticks. Though this more expensive unit has a better finish and durability, it would be better if it would also accept USB sticks and SD media like the cheaper one can. Either way this unit performs as described, is well made, and the packaging is also very nice. It even comes with a spare fuse.